Shoppers on Sotobori Street, in Tokyo’s fashionable Ginza shopping district, may have been surprised by a sweet scent of citrus hanging in the air. The refreshing smell can be traced to the first floor of Ginza Kumamoto-kan and its huge pile of “banpeiyu” which are now in season. Averaging 2 kg in weight and 20 cm in diameter, it is one of the largest citrus fruits in the world. The city of Yatsushiro, Kumamoto Prefecture, is blessed with a mild climate in winter and is known for its various citrus crops, including the grapefruitlike banpeiyu, a variety of the pummelo. “Banpeiyu can be enjoyed three ways — you can eat the fruit, you can eat the peel preserved in sugar and you can enjoy the scent,” for example, by putting peelings into a bath, shop spokesman Yasuhiro Yano said. The outlet sells about 900 items, ranging from food and beverages to traditional Kumamoto handicrafts. A major agricultural area, the prefecture provides various fresh seasonal fruit and vegetables, including sweet potatoes and tomatoes, all brought in directly from farms to the shop. “At first, we were worried that vegetables wouldn’t sell well because the shop is located in Ginza,” Yano said. It was hard to imagine people walking in this swanky shopping district with plastic bags filled with vegetables. However, the fruit and vegetables have become must-buy items, he said. 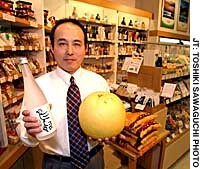 The outlet also offers more than 60 brands of local sake and “shochu” distilled spirits. Visitors are free to sample them. Especially noteworthy among the many sweets at the store is “ikinari dango,” a steamed dumpling made of mashed sweet potatoes and sweet red-bean paste rolled into a ball with a thin coat of wheat. It was the shop’s best selling item last year. The word “ikinari” means “sudden.” A typical homemade sweet in Kumamoto, its name comes from a saying that the treat is so common that even when a visitor turns up unexpectedly, every family already has it on hand, Yano explained. Located in a corner of the second floor is the prefecture’s tourist information center, where information is available through pamphlets as well as from staff. Next to it is an area where a range of events about Kumamoto Prefecture are showcased almost every month. Upcoming events include the popular fish fair, held several times throughout the year, where processed seafood from the prefecture will be sold. The fair will run from this Tuesday through the following weekend.